Story: Hibiki Shimada (Suzu Hirose) is 17 years old and high school student. While her friends Kawai (Ryo Ryusei) and Chigusa (Aoi Morikawa) adore some of their teachers and pretend to be in love with them, Shimada doesn't know exactly what love is. However, when by mistake she puts her friend's love letter in the locker of her history teacher Ito (Toma Ikuta) and after that visits him to explain that this was simply a mistake she realizes that she has feelings for him. After Ito, who is known for being stern and emotionless, brings his student Shimada to the hospital when he finds her hurt and even helps her with extra homework she is sure that her feelings for him are true. She confesses her love to Ito and proposes the deal that he responds to her love if she manages to get more than a 90 percent score in her next history test. Ito doesn't accept the deal and replies that such a relationship is out of the question. But since he laughs about her proposal she believes to have found a way to find happiness. While her friends give Shimada strength Ito constantly makes clear to her that he isn't interested in her. On the one hand Shimada wants to be able to express her feelings in all honesty and on the other hand she isn't willing to accept Ito turning her down, though. Review: "My Teacher" doesn't really promise to have an inventive story, but still one that might tackle a difficult topic. The teacher-student relationship, where the adult doesn't just take on the role of an individual that imparts knowledge, but in a certain way also raises students, is a role model to them and protects them, is almost sacred. Yet, as it is the case with any place in the world, if people share the same place day by day something like love might blossom. "My Teacher" deals with this subject without any big surprises, but with the kind of honesty that simply will win you over. Since the movie oozes out the kind of warmth and believable essence of what love is, which it is in strong need of, there isn't any reason why fans of romance shouldn't be just at the right address here. Granted, the cast may seem a bit odd at first. Toma Ikuta seems a bit older as the teacher than what you would expect with respect to the original manga by Kazune Kawahara. The age difference is supposed to be nine years, but it looks more like fifteen here. That's fine and all, but the age gap is never really brought up, only role allocation. As a teacher you simply can't love a student and Ito's general disinterest in people doesn't make anyone believe that he would ever fall in love. Of course, the plot follows the rules of a romance and so the history teacher turns out to be not just made of stone. Still, Ito remains somewhat shallow as a character, which is probably the movie's biggest issue. Yet, it doesn't hamper romance to continue unfolding. Nonetheless, there are a few moments in which the pacing drops and the director seems to be at a loss which direction to go next. 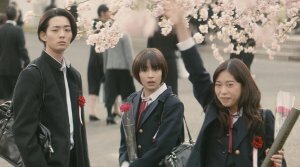 However, Suzu Hirose ("Your Lie in April") carries the movie and her character's feelings believable, even though Shimada sometimes fits the archetypical image of the clumsy wallflower. Problems, bullying etc. is nothing you will find at Shimada's school, and this even though there is a picture of a pretty unpleasant situation going around at some point. You can absolutely say that "My Teacher" is taking place in an idyllic world, in which Shimada's friends always support her and don't start talking sense into her. Adults are doing that already, anyway. Everyone is sort of getting along and this at the cost of the film's authenticity. Still, nowadays it's even preferable to get a pure romantic story with only few obstacles along the way than the countless romantic-drama hybrids. This brings us to an interesting phenomenon. The story isn't anything to write home about, the main characters also would have deserved some more colors, but the love story is approached with the kind of pureness which portrays everything in a glorified manner and makes a breeze of fresh energy and briskness blow through the screen. There are many movies that try to convey this through pictures that feature a lot of light from a setting sun falling through windows, but here the total package is well achieved thanks to the rest of the movie, like the plot, as well. 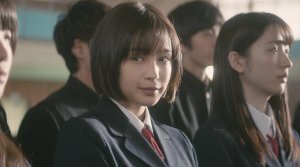 Director Takahiro Miki has already proven with his way more fantasy-oriented "My Tomorrow, Your Yesterday" that he has a knack for love stories and once again it's those subtleties and nuances of the dialogues that prevent them from becoming sappy, but actually make them succeed in creating a warm feeling in your heart. In the end, it needs to be said that the movie isn't gutsy enough, though. Apart from that there are a few nice ideas featured thanks to the friends Kawai and Chigusa who are in fact colorful characters and not just some cogs in the story that keep things moving. I won't go as far as to say that there are some complex train of thoughts touched upon, but it at least becomes clear that there is no right or wrong concerning this kind of love. After all, it's about feelings. In the hands of a good director this can be complex enough. Surely, there will be those, though, who contrary to me will be able to compare the picture with the original manga. Particularly individuals like Fujioka and the two teachers Sekiya and Nakajima get only a raw deal. Especially since Kawai is in love with latter one this is a shame since this would have given room to a story unfolding parallel to that of Shimada and Ito, just going in a different direction. In the end "My Teacher" is just the kind of good genre entertainment, with all its strengths and weaknesses, that will leave you with a warm, fuzzy feeling. That's what movies are for, too.